A few pics from our recent trip to Hot Creek Ranch. First two day were really cold and fishing was tough but the weather warmed and the bugs began to hatch. Our last day was epic, with caddis and Baetis hatching and fish feeding voraciously. All in all a great trip with good friends. Two friends in recent days have emailed or called me with reports of their "fish of a lifetime". David called me on a Sunday morning with the news that he had landed and released a huge (8.25lb) Calico Bass that, had he decided to keep it and submit it, would have been a new fly rod world record. Jamie emailed me with a picture of a 30lb plus Permit that was made all the more special because he was on a treasured fishing trip with his Dad. What defines a "fish of a lifetime"? Is it the size of the fish or the circumstances under which the fish is captured. Both of these guys will cherish the memory of that special catch, but for different reasons. I guess what I am saying is that a "fish of a lifetime" is what you dream it to be. I remember one special "fish of a lifetime". Fifteen years ago I was fishing with my young family on the wonderful Williamson River in South Eastern Oregon. My oldest son, Chris, was about 10 or 11 at the time and was already a skilled fly fisherman. It was early morning and the river was shrouded in a fine mist that was penetrating and cold. The water was an even 57 degrees and the fish were not cooperating. 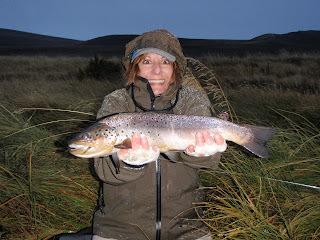 I had waded out into the cold currents and Chris was positioned down-current from me with his short 5 wt rod. We were high-stick nymphing in search of some of the giant rainbows that migrate up from Klamath Lake to seek sanctuary in the icy currents of the Williamson. The very cool air temp and the icy currents combined to start Chris' teeth chattering and I was concerned that it would deteriorate into hypothermia. "Go back to the tent and warm up" I told him and, despite his protestations, he complied disappearing into the campground toward our tent. I continued fishing my way down the wide run covering the water with successive fan casts that covered the holding water thoroughly. I became aware of a disturbance to my right and turned to discover Chris wading out toward my position. My first inclination was to scold him for not following directions but the look on his face made me pause. I remembered wanting a fish that badly. Wanting to please my dad, wanting something sooo much that I was willing to face whatever came along to get there. Tears welled in my eyes as I watched this determined kid brave the cold currents in search of a trout. I choked down my feelings and coached him on how to position his cast to get the best angle on the run below him. And, inside, I prayed to the fish Gods to smile on this little angler and give him a strike. My prayers were answered within seconds as a 20" rainbow slammed his Hares Ear wet fly with a savage boil and a twisting acrobatic run and then stayed pinned long enough to slide into the net. A pure silver hen fish lay gleaming in the net, but I could only see the face of that little boy and the pride of his accomplishment through a blur of my tears. A fish of a lifetime is what you make of it. Get out there! Spent a really pleasant Wednesday morning with David Wratchford and Artin Marootian at the Castaic Lake chasing LM Bass and Stripers. It was still dark when I rolled into the Mickey D’s parking lot. Artin and David were already there and their enthusiasm was infectious as we trooped into the restaurant for a quick bite. My usual breakfast, these days, is a bowl of granola with yogurt but, today, I treated myself to a Sausage McMuffin, Hash Browns and a coffee. It’s been years since I had one of these sandwiches and, I have to admit, that it was delicious. Maybe it was because of the anticipation of a fine morning on the water or the fact that I was cheating a little but that damned thing tasted great. We soon completed our fast food fix and headed to the lake to wait for the gate to open. At this time of year the gate opens at 7:00 a.m. which is about a half hour too late to really hit the morning bite, but we would have to make do. We had intel that the bass had been pushing bait against the shore along the west side of the lake. We rigged our rods with Threadfin Shad imitations, all the time staring at the water for signs of activity. We saw a few small, scattered eruptions as the predators ripped into the hapless bait schools but not the frenzied activity that we were looking for. We began to work our way along the shoreline, which was accessible because of the extremely low water levels, casting our sinking heads into likely areas and counting down to try and find the schools. I spotted some fish breaking in a deep cove and alerted the guys who spread out along the shoreline and began fan casting as we moved along. Artin was rewarded with a fiesty LM bass in the 12 inch size range and I got a hard pull but didn’t hook the fish. David made his way carefully along the loose boulder rubble on the opposite shore toward a small but persistent school of busting fish. His efforts were rewarded almost instantly with a 3lb Striper that slammed his fast-stripped Electric Deceiver. I was feeling left out. David soon landed a LM and another Striper and I decided I needed to move. I had had some follows and short strikes but no solid connections. I worked my way around the cove and shuffled along the steep unstable slope, past David and finally, down to the water’s edge, but still no love. It was one of those days when the fish were breaking were my fly wasn’t. I would cast to the left and the fish would come up to the right and vice versa. That was the way the morning went. Dave ended up with four Stripers and two LM Bass, Artin had three LM Bass and I had zilch. Still, it was a fine couple of hours and we were well satisfied with the morning. My chores were waiting to be completed when I got home but I took the time to tie a couple of flies that more closely matched the size of the Shad that we had seen. After the chores were completed I decided to head back up to the lake and see if could get rid of the skunk smell on my rod and reel. The wind had pick up to a stiff on-shore breeze that made casting a little more challenging but my reel was loaded with 30’ of Rio T8, a tungsten impregnated, sinking line followed by 110’ of Rio Slickshooter and I was able to blast out 80’-90’ consistently without too much effort. My persistence paid off when a 10” LM Bass jumped on the fly and was soon followed by another about 12” a few casts later. Goodbye Mr. Skunk. The full-on bite, however, did not materialize and I had to be content with those two small fish. I took heart in the fact that the guys fishing with live shad as bait were skunked and a young man fishing a silver Kastmaster lure caught the only other fish I saw. I did run into Larry Kurosaki who was walking the shore with his little dog Katie and he reported catching a few fish in an adjacent cove. So, take this as a heads-up to get yourself out on our local lakes before the colder weather drives the shad deep. This is prime time to get hooked up with these hard fighting fish and in good numbers. So, no excuses! Time to get out there! Estancia del Zorro sits on the high "pampas" on the Chilean side of the border in Southern Patagonia. The spring creek meanders across the landscape with deep curling currents that harbor huge brown trout. The grazing alpaca and sheep glance up occasionally to assure themselves that you have no interest in their offspring and the Andean Condors that wheel overhead watch carefully in case you have suddenly kicked the bucket. This high prairie has few features to slow the upwelling winds from the Pacific coast line so, to catch trout here, you must be able to cast effectively with the wind pushing from different directions. Pinpoint accuracy is key to getting a drag free drift over these big fish who leisurely sip bugs at the very edge of the prolific weed beds a and tight against the grassy banks. 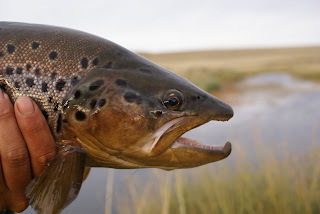 What is a huge brown trout? For me, anything over twenty five inches is big but in this creek there are browns well over thirty inches and a few over thirty six. This is a dry fly fishery without peer, although you can fish it with nymphs etc., and people from around the world travel to sample it each season. The Galilea family has been ranching here since the 1940s and their reputation for fine wools and succulent free range meat is international. Sebastian Galilea and his brother Juan Andreas manage the fishing side of the family business and they have honed it to a fine art. To arrive at Zorro is to immediately feel welcome and like you are, perhaps, a visiting cousin or long lost family member returning to your roots. On Tuesday, October 13th, at 6:30 pm Sebastian and, head guide, Claudio Joost will be here at the Spot to meet interested anglers and show us the beauty of this tremendous resource. We will supply the Chilean wine and some fine cheese to accompany it. Claudio will be tying some of the flies that work well in this part of Patagonia and we hope to see some of you here.